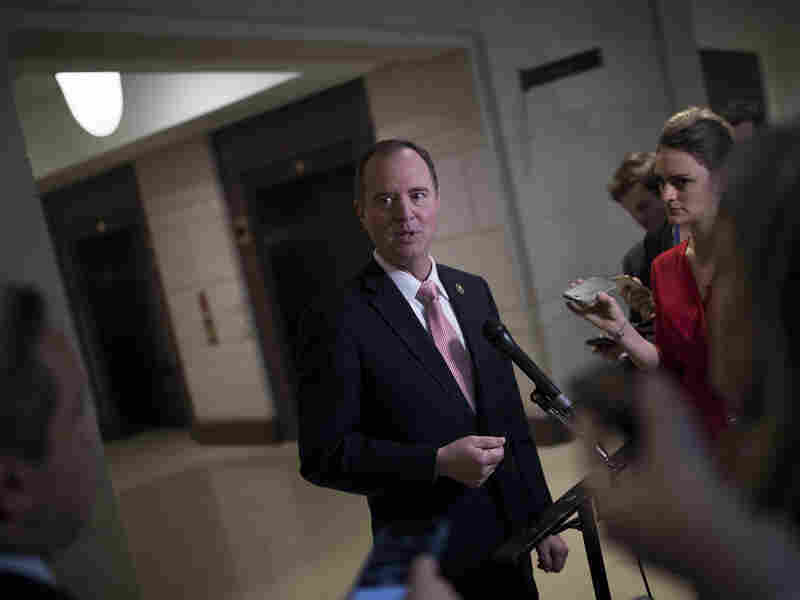 NPR News Interview Congressman Adam Schiff NPR's Mary Louise Kelly spoke with Schiff about his top priorities on the Intelligence Committee as well as his reaction to the resignation of Attorney General Jeff Sessions. With control of U.S. House of Representatives changing parties, Congressman Adam Schiff, D-Calif., becomes the presumptive Chairman of the House Intelligence Committee. NPR's Mary Louise Kelly spoke with Schiff on today's edition of All Things Considered to discuss his top priorities on the Committee as well as his reaction to the resignation of Attorney General Jeff Sessions. "This underscores the urgency of protecting the Mueller investigation. It's going to be imperative that the Senate not confirm anyone [as attorney general] who doesn't commit to defending the independence of Mueller's work, as well as frankly, the independence of the Justice Department. Because it's plain the gripe that this president has had with this attorney general is that he won't make a criminal case go away in which the President may be implicated, and that is about as impermissible as it gets." The attorney general now steps into the shoes of [Deputy Attorney General] Rod Rosenstein. The new ag would become [Special Counsel] Bob Mueller's boss and make those decisions. The new attorney general would presumably not be recused, and therefore it's a more shrewd way and potentially more nefarious way to interfere or cripple the Mueller investigation than doing something overt like firing Mueller. That new Attorney General can decide the scope of what Mueller looks at; whether the report that Bob Mueller produces goes to Congress, is made public or gets buried. I think it's going to be enormously important that the Committee protect the investigation of Muller instead of attack it – so that will be quite a sea change for our committee. But we're also going to want to restore our relationship with the intelligence community and law enforcement that was so badly damaged by the publication of the Nunes memorandum. "There is evidence that we gathered that we would like to share with the special counsel. There is also testimony of witnesses before our committee in which we have profound concerns over whether they committed perjury..."
"There certainly have been issued raised within the last couple weeks pertaining to Roger Stone with the release of email, which if authentic would that some of his answers before our committee are highly suspect. And I think it's something Bob Mueller should have the benefit of." "We know that there were calls going back and forth between [Donald Trump Jr.] and a Russian named Emin Agalarov....calls going back and forth between the two of them in the run-up to the Trump Tower meeting, where the president's son was trying to find out whether this offer of dirt on Hillary Clinton, as what was described as part of the Russian government's effort to help the Trump campaign, was real..."
"In between these calls...there's a third call sandwiched between them from a blocked number. Now we know the president used a blocked phone during the campaign so naturally we sought to subpoena the phone records to determine: did the president speak with his son in between these calls, in which the president was made aware of or gave approval to this meeting? That's obviously pivotal in terms of the president's involvement in any potential collusion or conspiracy to seek Russian help --illegal Russian help during the campaign..."
"...One issue in particular concerns me that we were not allowed to pursue, that the Senate was not allowed to pursue, and that is the issue of whether the Russians were laundering money through the Trump Organization and this is leverage they possess over the president of the United States."